This is the perfect Autism Themed gift . This selection includes 15 delicious large confections of filled molded chocolates covered in our rich Belgium chocolate. The chocolates are filled with our signature caramel, vanilla bean and dark chocolate ganache. 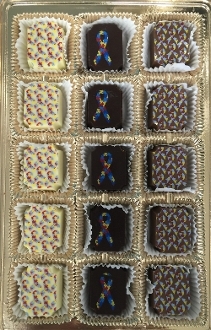 And each one is decorated with Autism ribbons. Give the gift of love and honor to all those you know who are touched by autism. Need a larger box of chocolate? Double Decker ( 30 confections) it for only $25 more.